The entire weekend of Saturday June 17th/18th (Father's Day Weekend) was highlighted all week as a potential two day severe weather event across central and eastern Ontario. Of the two days, Sunday featured better severe weather parameters: better 0-6km wind shear and better overall directional shear, better 0-1km wind shear, supposedly higher CAPE values (this did not happen, as clouds aloft did not dissipate throughout the day, which ended up killing overall storm potential energy). I had a baseball game to attend mid-day Sunday, so Saturday was my best (read as: only) chance to see some bad weather. After reviewing some weather models and checking the visible satellite early Saturday morning (about 10am), I saw two areas of interest that would fire relatively early in the day around 1pm: an area near London, Ontario and another area further to the north near Durham, Ontario. There would be more severe weather later on in the day that would traverse across Lake Huron in the form of a squall line, but would carry a much lower tornado threat as a result. I'll get to this in a bit. 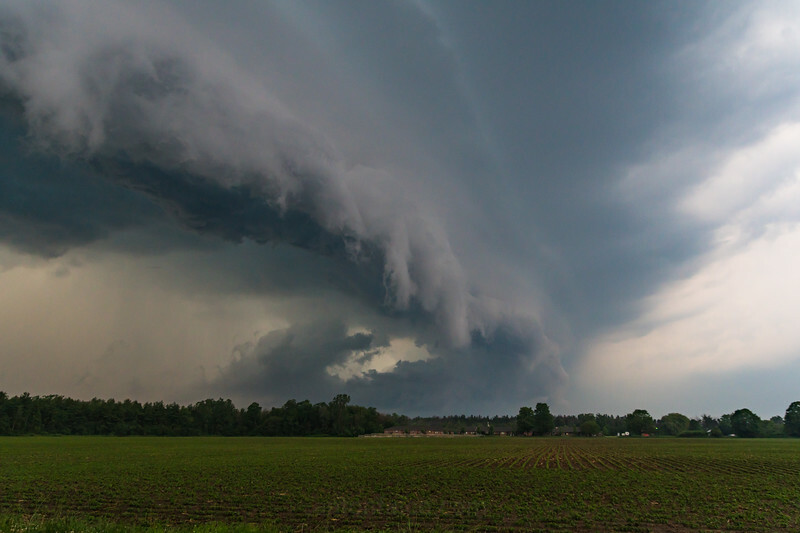 I decided to go towards the south London target because, a) it would take me just over an hour to get there, as opposed to several hours to get to the Durham region, and b) despite having better severe parameters to the north, convection looked a lot messier; there were supercells ongoing, but were surrounded by far less discrete storms. I imagined they'd become consumed by surrounding convection/interrupted by outflow boundaries. I set my original target area to be Belmont, Ontario because the southern part of the storm system was showing broad rotation, and was not directly connected to the line of convection ongoing. It was also the strongest section of the storm system. The Belmont area gave me a nice road network to work with as well; I had a nice grid of roads for many different escape routes, as well as ways of keeping up with the storm if it got stronger. I pulled over on Road 73 and saw the developing wall cloud (as seen above). I stuck around for about 10 minutes and watched it begin to tighten up as it closed ground on me from the west. As it got close to be and began to rain lightly, I pushed a bit further south down the road. When I pulled over, I saw the funnel cloud begin to develop behind me (as pictured above). Mark Robinson of the Weather Network was right beside me at the time. I did not see it touch down, nor did I see any visible dust kicked up at the surface. After about a minute or two, the entire cloud structure was gone. It completely dissipated. At this point, I went for lunch just outside London (I didn't plan it out. I settled for a Sweet Onion Chicken Teriyaki at Subway). After lunch, and reviewing the models, I decided to push back to the west and wait for the incoming mix of squall line and embedded supercells to push off Lake Huron into Ontario a few hours later. I decided that the Grand Bend, Ontario region would give me the best bet in seeing this incoming storm and I'd arrive about an hour before they arrived. I expected to see lightning and a prominent shelf cloud, but little to no chance of a tornado. The picture above was a smaller cell coming ashore before the second wave behind it. 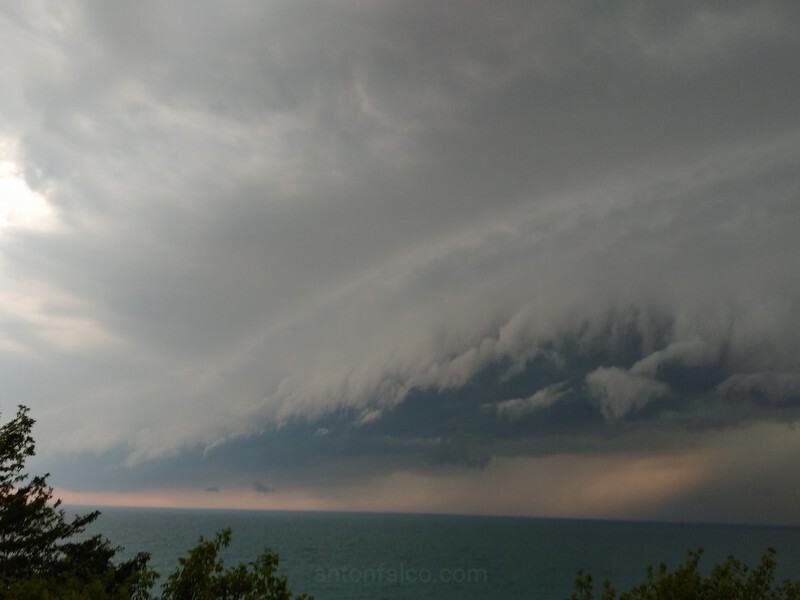 When the second wave did come ashore, I was treated to an amazing shelf cloud. The pictures will be below this text. I was hoping for lots of lightning, but it was largely obscured from view by the rain. The shelf cloud was pushing ashore FAST. I was traveling around 80km/hr and was barely outrunning it, as opposed to most storms that 80km/hr easily outruns them. It overtook me at one point as you'll see in one of the pics below titled "The Whale's Mouth". I like to stay dry when I'm chasing storms, so I try to stay a bit further ahead of them. This also gives me the best opportunities to get the most photogenic images. As I tracked to the east, I reached Mitchell, Ontario. I turned around to get a panorama of a large shelf cloud that I had just gotten out of the grasp of, and a nice shot of a sunset behind some of the dying storm clouds. All in all, a decent storm chase day on the Saturday. Some photogenic pictures, and a good drive. No tornadoes on this day, but a funnel cloud in close range, meeting some Ontario chasers for the first time and a visit to some new smaller towns. Destination for the night: My Comfortable Bed.